The landowners’ attorney made it even more interesting, referring to Sabal Trail’s “propaganda” and getting the judge to entertain the possibility that Sabal Trail, at the behest of their “puppeteers” in Houston, had made the MGAG deal as a “subterfuge” to get around the “in the State of Georgia” legal requirement, which might even be called “fraud”. 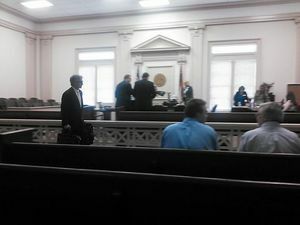 Picture taken while court was not in session. Sabal Trail attorney with briefcase, lead attorneys with the judge, landowners sitting on front row. The power of eminent domain may be exercised by persons who are or may be engaged in constructing or operating pipelines for the transportation or distribution of natural or artificial gas and by persons who are or may be engaged in furnishing natural or artificial gas for heating, lighting, or power purposes in the State of Georgia. It became very clear what Sabal Trail would like the least: a jury trial. Second least: an evidentiary hearing. The judge granted neither, but he did agree to 10 days for the landowners’ attorney to submit an evidentiary brief, followed by 10 days for Sabal Trail’s attorneys to do the same, after which the judge would decide. Other parties can submit amicus curiae briefs, as well. This is all according to my understanding from observing the hearing yesterday, and remember I am not a lawyer. However, my name did come up; see other post.